- The course will focus more on synthetic and treatments identification, marketing, pricing for both colored stones and diamond. - The course can be flexible according to each individual and group requirement on specific stones. In this course you will focus mostly on practical part with a short review of theory. 1. 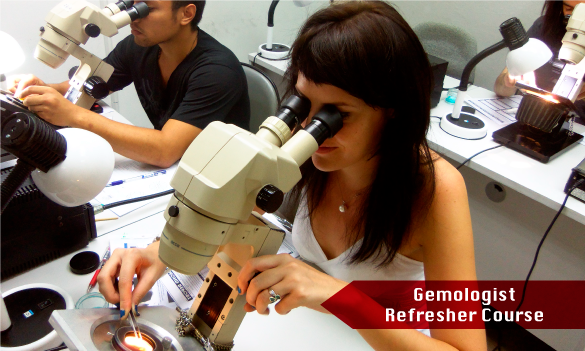 Gemologists who need to refresh their knowledge in order to feel more confident in their career. 2. Inactive gemologists who want to achieve new success. 3. Those who want to be updated with new information such as new gemstones, new treatments, new mines, new marketing and pricing. 2 Sep - 6 Sep, 2019 Register Now!11 Nov - 15 Nov, 2019 Register Now! gemologist, refresher course, refresh, new gemstones, treatments, mines, marketing, pricing.